At least, that’s how my office staff feels, and once a month, our ‘staff spirit’ committee organizes a potluck to bring people together for at least one lunch. My first office potluck’s theme was “The Last Supper” and everyone was asked to bring dishes that began with their last initial. It was a fun theme and I brought noodles (japchae) and Nutella Banana Bread. YUM! For this last potluck, the theme was Asian food. I was pressed for time so chose to do something super easy and Americanized, but at least somewhat healthy and hopefully appealing to the masses. Who doesn’t love chinese chicken salad? Unfortunately, it is usually laden with fried wontons and syrupy dressing … so I decided to make my own version of Kale Chinese Chicken Salad. 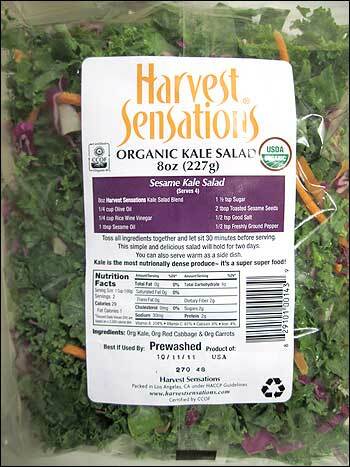 As a heartier green, the kale would remain nice and crisp even an hour or two after I tossed the salad in the dressing – just what I was looking for! Preparation was made exceedingly easy by a trip to my nearby Whole Foods – after snagging one of their flavorful rotisserie chickens and a bag of their Harvest Sensations Kale Salad mix, I was all set to go! Preheat oven to 350 degrees F. Spray wonton strips with a little vegetable oil and distribute evenly in a single layer on a large cookie sheet. Bake ~6-8 minutes or until golden-brown, stirring half-way through to allow for even crisping. Set aside. Whisk together soy sauce, lemon juice, ponzu (if using), sugar, vinegar, salt, and pepper in a small bowl, then add sesame oil and grapeseed/canola oil in a slow stream, whisking until sugar is dissolved and dressing is combined well. Adjust seasoning to taste. Toss chicken and scallions with 1/3 cup of dressing in another large bowl. Toss kale salad mixture with enough remaining dressing to coat, massaging in the dressing. 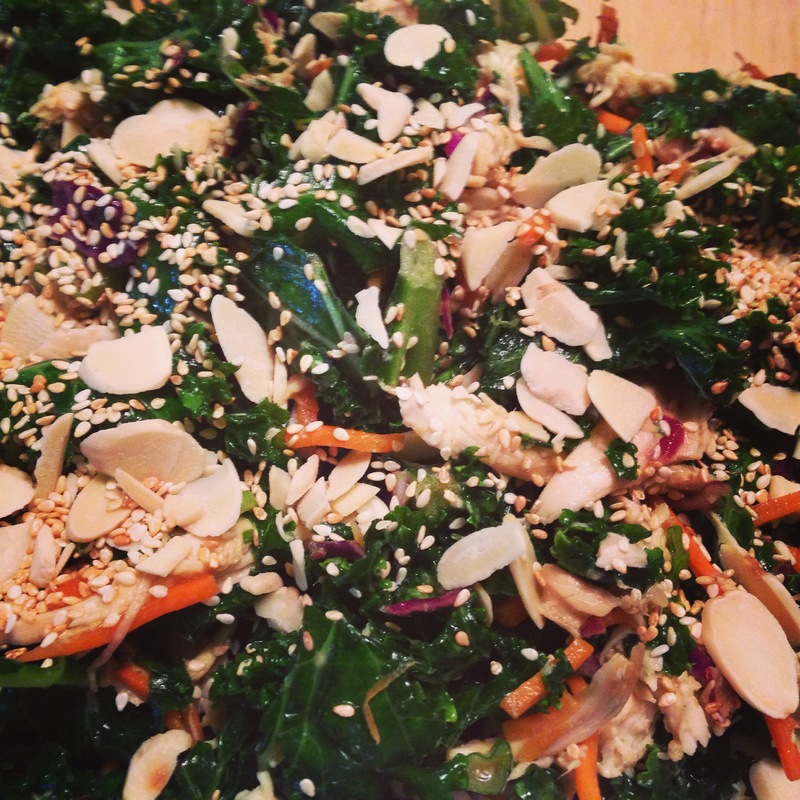 Add chicken, scallions, cilantro, almonds, and sesame seeds to the kale and toss well. Just before serving, top with wonton crisps. Optional additions: blanched snow peas or sugar snap peas, mandarin orange slices (pith removed). J continues to be flummoxed by how little I know about American football, despite growing up in the U.S. He simply shakes his head at my clueless look when he runs around talking about first downs, field goals, and blahblahblah. 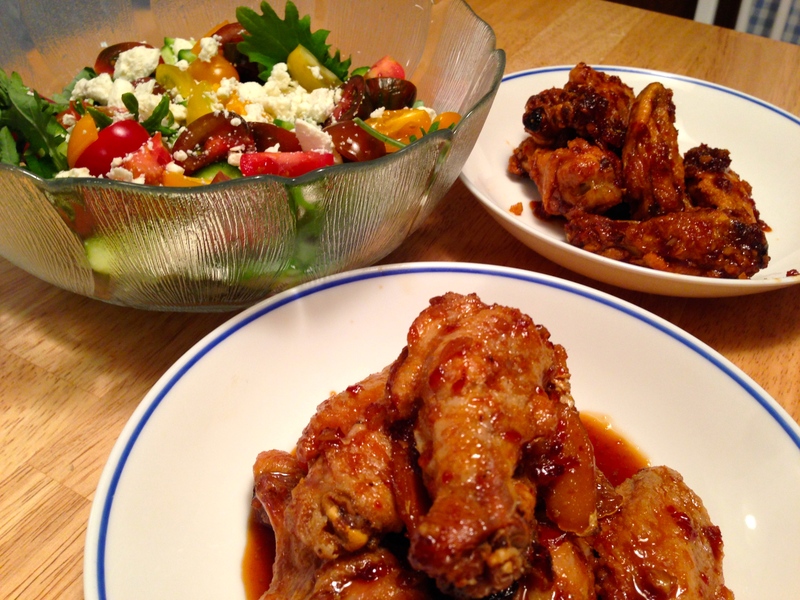 Fortunately, we can meet in the middle: he watches football and I spend that time amusing myself by making him snacks like these, which are a slightly healthier version of the ubiquitous chicken wings that grace so many Super Bowl parties. And maybe, just maybe, learn a little about football. I’m a little reluctant to clean up the mess that comes with deep frying, so opted to oven-bake these using the Cooks Illustrated method instead. With this method, fat is rendered by baking them at lower heat and then followed by browning at higher heat, achieving an enviable crispness and moistness that rivals the deep frying technique! (Clearly, I made the salad for me 😉 ). 1. Adjust oven racks to lower-middle and upper-middle positions and preheat to 250 degrees F. Set a wire rack onto a foil lined rimmed baking sheet. 2. Pat dry and prep chicken wings and place into a large ziplock bag with baking powder and salt. Seal and toss to coat evenly. 3. Arrange the wings, skin side up, on a single layer on the rack and bake on the lower rack in the oven for 30 minutes at 250 degrees F.
4. Move the wings to the upper rack, increase the temperature to 425 degrees F, and roast until golden brown and crispy, about 40-50 minutes. Rotate the sheet halfway through baking to allow for even browning. 5. 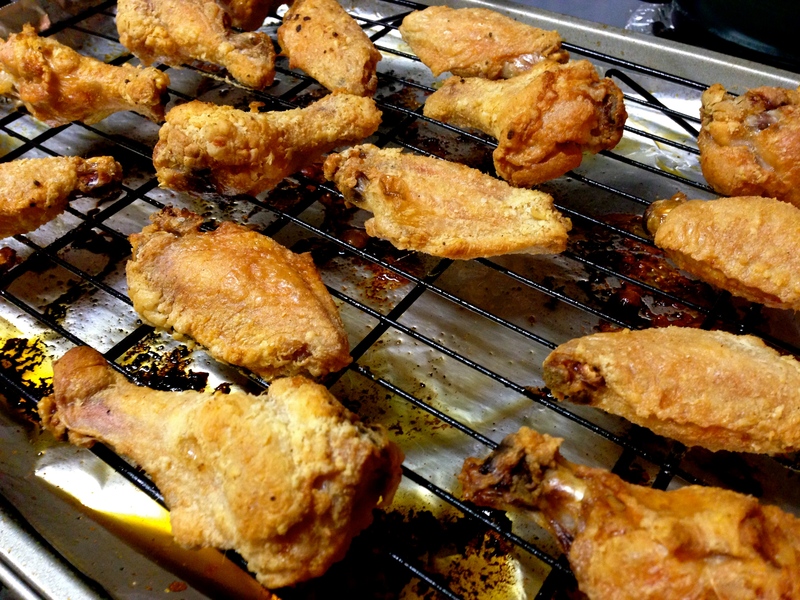 Remove from the oven and let stand 5 minutes before transferring to a large bowl and tossing with wing sauce. Enjoy hot! 1. In a small saucepan, combine water, ginger, garlic, soy sauce, fish sauce, vinegar, sugar and chile and bring to a boil. 2. Add honey and reduce by half until it has the consistency of maple syrup and set aside. Between clinical work and finishing up clinical and research work in the evening once I leave the office, it often feels like the days are too short by the time I’ve managed to exercise and do a few chores or run errands. That said, there is *always* time to be inspired to cook, using new and old recipes. Even more so when there’s company for dinner! Tonight, I planned ahead and prepared mae-un dak gui, or Korean chili paste spicy chicken. I served it with stir-fried green beans, bok choy with ginger, mushrooms sautéed in miso butter, and brown rice. Total comfort food, and a wonderful way to break in the new grill pan I received for Christmas! The chicken itself needs to marinate at least 8 hrs (preferably overnight) – it is simple to throw together the night before or early in the morning before work, which is exactly what I did. With flash-stir-fried veggies, it makes for a quick weeknight dinner! 1. In a large bowl, mix the gochujang, soy sauce, water, white sugar, mirin, onion, ginger and garlic together. Make sure that the sugar is well incorporated in the marinade. 3. Cover and marinate for at least 8 hrs or overnight. 4. When ready to cook, heat the grill pan over medium heat. Cook for about 7-9 minutes on one side over lower heat, as the higher sugar content of the marinade lends itself to burning. Do not move for the first few minutes to allow for searing and caramelization of the meat. Add chopped white scallion parts. 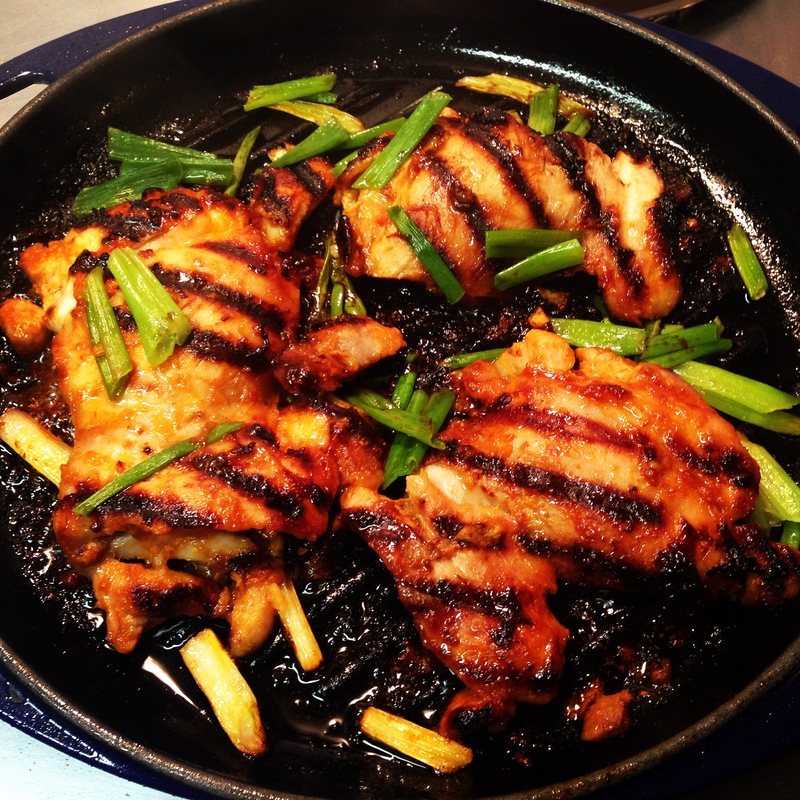 Turn chicken and cook an additional 7-9 minutes on the other side, adding chopped green scallion parts about 1-2 minutes prior to removing the grill pan from the heat, just long enough to wilt slightly.